Galvanized steel isn’t sufficient rust prevention in a Canadian Winter. In Ontario we get to deal with some nasty winter weather. Cold, mean and cruel, winter can relentlessly torment the majority of us for months on end – it can feel like it will never end. Some years are so enduring that even the most passionate winter-loving Canadians can reach their limits. Thankfully Ontario residents are resourceful and hardy. We have things to deal with these inhuman conditions: wind resistant coats with down-filled linings, thermal socks, hats with ear flaps, electric blankets and let’s not forget a steaming cup of cocoa to help remove the chill from our bones. But what if you were a car or a truck, stuck in these conditions with no chance of reprieve until spring has sprung? The kicker is, it’s not the temperature or the blustery northern winds that deliver the relentless blows to the metal in your vehicle; it’s how our public works departments have decided to manage our snowy, icy roads. Beyond snow removal and snow plowing, transportation managers have determined road salting to be an absolute necessity in the battle against ice-riddled roads. Salt and sand are necessary safety precautions we don’t want to lose. It’s nice to know as a driver that road ice can be effectively managed, especially as you are approaching a snow-covered or slippery intersection. But our vehicles, if you take a close look, tell a very different story. 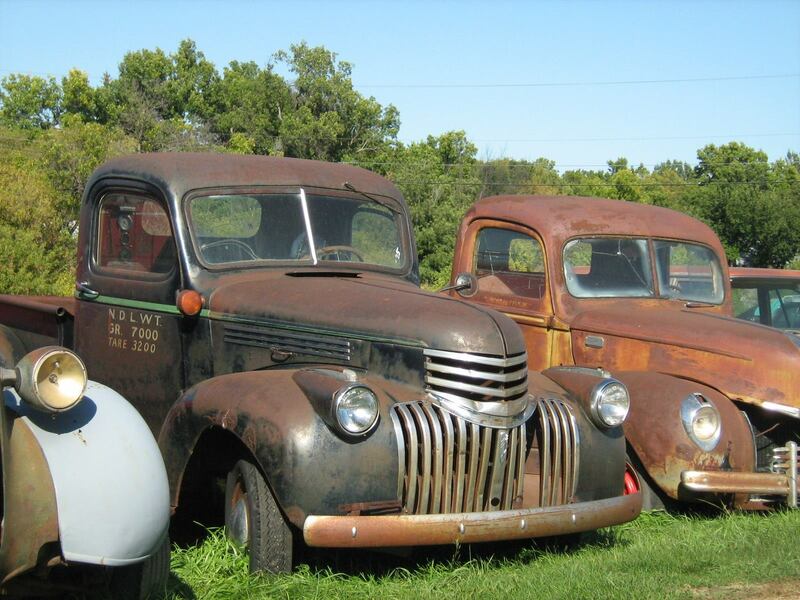 Corrosion and rust are the results of oxidation. Oxidation of metal is caused by a chemical reaction between the metal and the environment. Rust is iron oxide, a molecule consisting of two iron atoms and three oxygen atoms. Iron oxidation happens through a chemical reaction that goes like this: iron plus (+) oxygen multiplied (x) by water or air moisture equals (=) rust. We have a perfect environment for corrosion to flourish — now add time and an accelerant like sodium chloride or salt. A Canadian vehicle is constantly under attack by corrosion, but especially in winter. Your vehicle’s exterior is comprised mostly of iron – because iron is the mineral that gives us steel. According to an article by Marshall Brain and Robert Lamb posted at HowStuffWorks.com, iron is a big player: “If you had to name the technologies that had the greatest effect on modern society, the refining of the heavy metal element iron would have to be near the top. Iron makes up a huge array of modern products. especially carbon-rich, commercial iron, which we call steel. Cars, tractors, bridges, trains (and their rails), tools, skyscrapers, guns and ships all depend on iron and steel to make them strong. Iron is so important that primitive societies are measured by the point at which they learn how to refine it. This is where the “Iron Age” classification comes from. A Canadian winter can be torturous proving grounds to a vehicle’s ability to function correctly under extreme conditions. Car owners buy a number of items to give their vehicle an edge over winter: block heaters so their cars will start on sub-zero days, special wiper blades that move slush, ice and snow from windshields, and winter tires that are more of a necessity than they are an option any more. But there is one more item on many vehicle owners’ winter checklist: wrapping their cars in a warm blanket of rust protection. In an effort to combat the relentless issue of metal oxidation auto manufacturers sought ways to increase the life of their products. One of the biggest steps was the introduction of galvanized steel. The use of galvanized steel does present a partial solution: it delays the onset of oxidation but it simply can’t curb it completely. New materials such as plastics and composites have also contributed to a vehicles’ on-road life. However metal still makes up the vital components of every vehicle. Your car’s body, wheel wells, frame, engine compartment, trunk and gas tank all need to be protected. In recent years we have witnessed another type of oxidation, a more cunning variant, causing rust damage many times faster due to an electro-chemical reaction. What causes this electro-chemical reaction? It’s a simple ingredient: road salt (sodium chloride). Canada uses approximately 5 million tonnes of road salt per winter to help create safe driving conditions. With a number so overwhelming, it’s clear that avoiding the components of oxidation is not an option. For Canadian roads and corrosion conditions, Oil Gard Anti-Rust formulas are a cost-effective solution. Not only do the Classic and Formula 2 No-Drip provide superior staying power to your vehicle’s undercarriage, but they also actively displace water – a key element in oxidation and corrosion. Oil Gard’s Formula 2 or Classic formulas do more than coat the metal. With a unique application process and active ingredients, Oil Gard protects by providing superior penetration of metal pores, seams and joints where moisture will collect. Oil Gard’s proven rust prevention formulas effectively displace and protect your car or truck from the forces of corrosion. So you can feel reassured, and you can truly duck the rust.